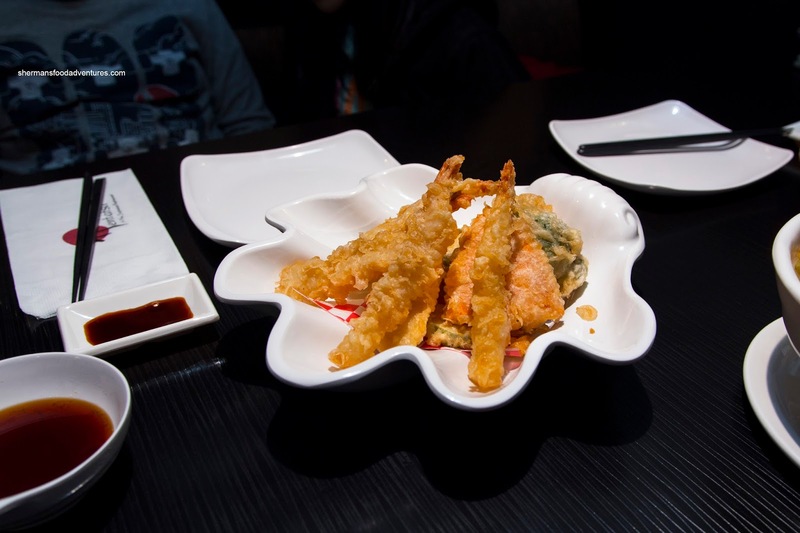 For some people, the proliferation of "value, non-authentic" Japanese restaurants is a complete negative. As much as I love authentic, simple and properly prepared sushi, it is not truly a sustainable habit if one isn't made of money. 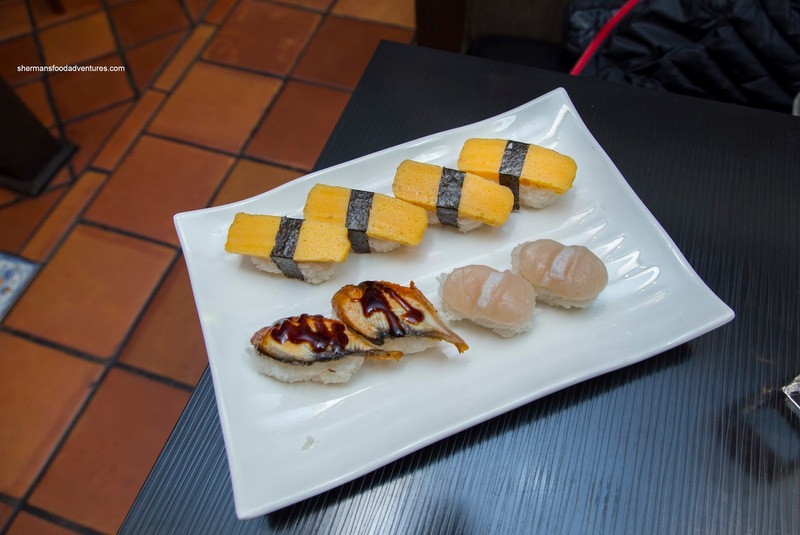 Therefore, when it comes to the everyday "on-a-whim" meal, these well-portioned and inexpensive Japanese restaurants remain popular with the majority of diners. 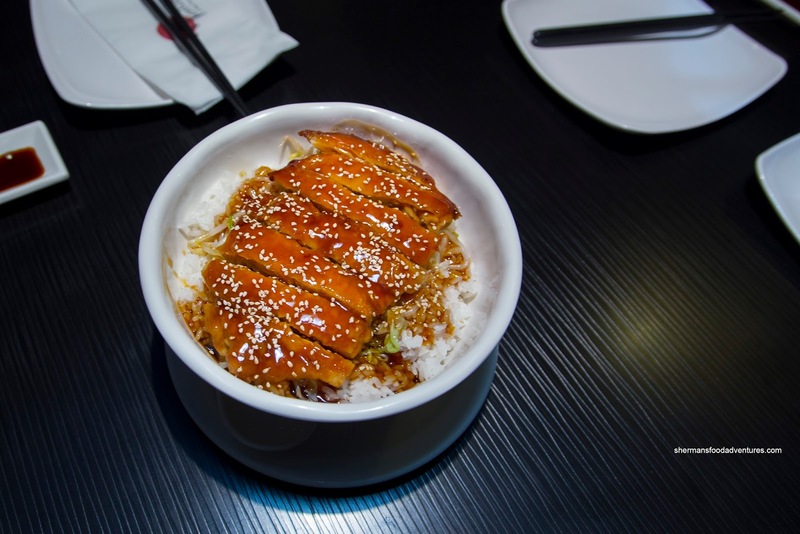 Food connoisseurs can cry foul and whine all they want about this phenomenon, but it will continue to exist much like the many chain restaurants we have in town. 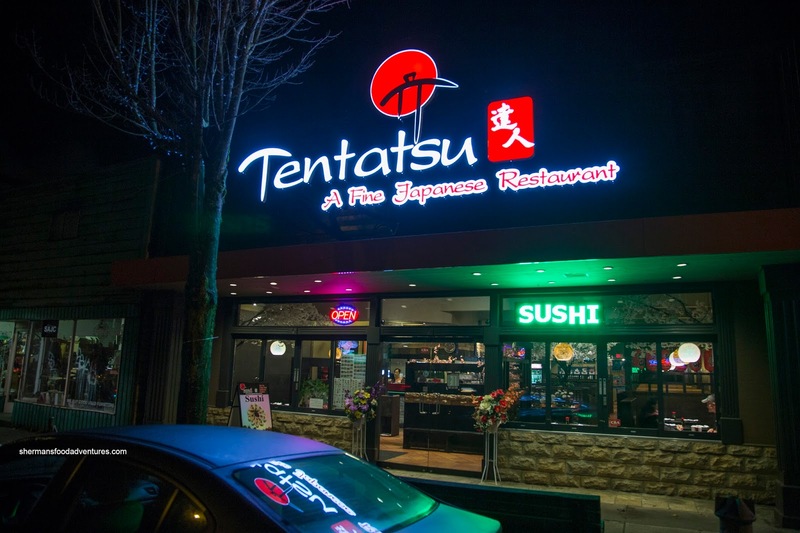 One of these restaurants is Tentatsu, where we checked out their 2nd location in Burnaby. A bit messily plated, the Assorted Tempura was actually on point. Each piece of veggie including sweet potato, yam, broccoli, carrot, mushroom and zucchini were cooked properly and were graced with a thin layer of crispy batter. There was very little greasiness to be found, even on the bottom of the plate. As for the ebi, it was buttery with a light snap. For $6.95, the Chicken Teri Don was massive. However, there was a bit too much rice (this will be the trend for the meal) in relation to the chicken. That is not to say there wasn't a lot of chicken because there was. It was fairly tender and nicely lacquered with teriyaki sauce. Underneath, the rice was a bit soft and there was not enough sauce to flavour the entire bowl. Majestically plated on a mini-wooden boat, the Tentatsu Sashimi was large in size as a whole and pieces in general. 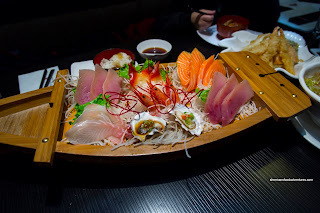 I'm personally not a huge fan of massive slices of sashimi as it detracts from the texture and really, it shouldn't be a 2 or even 3 bite exercise. I can't deny the value here as there was more than enough Atlantic salmon, albacore tuna, snapper, hokkigai, ebi and oyster for $18.95. Texturally, the fish was actually decent with the salmon being better than the tuna. I found the ebi to be surprisingly sweet and buttery. Remember what I said about the abundance of rice? Well, that was completely evident with the Nigiri (Tamago, Unagi and Hotate) as this was the most I've ever seen for this type of sushi. There was easily double the amount of a typical nigiri. The rice was a bit soft too which made things texturally unappealing. The same theme continued with the NYC Roll with spicy tuna topped with chopped scallop and bonito. 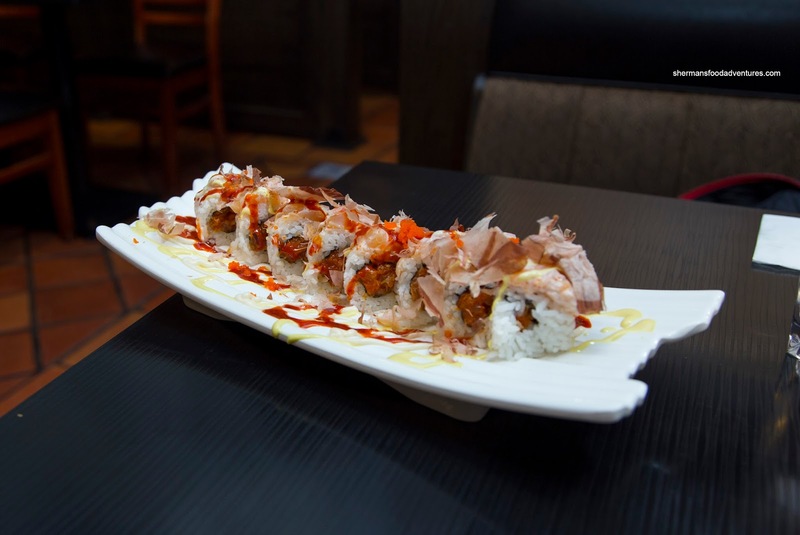 The layer of rice on the outside of the roll was thick and a bit mealy due to the moisture. I found the spicy tuna to be quite nice actually, which lessened the blow of the rice as the flavour was impactful enough. The buttery scallops on the outside were also surprising, but they were somewhat overwhelmed by the combination of sweet mayo and a honey mustard type dressing. 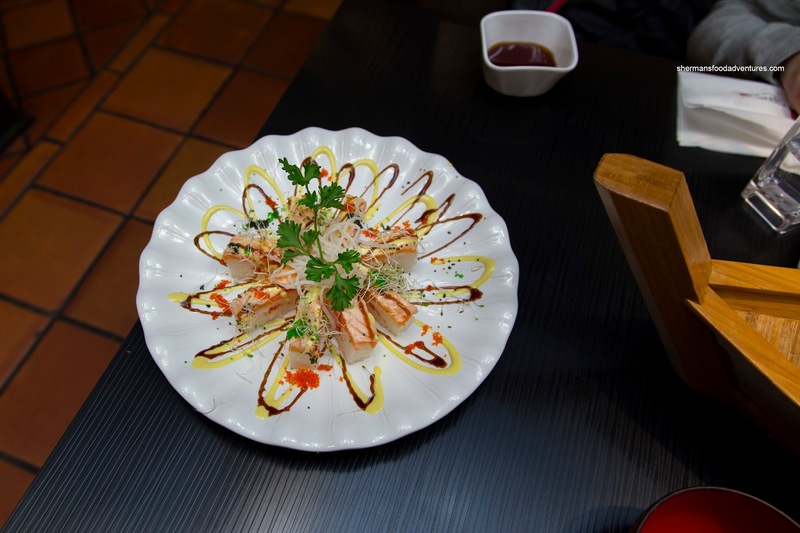 The most excessive use of rice was with the Aburi Salmon Oshi as there was 1/2 more than other versions. Hence it ate dense and the salmon was overwhelmed. It was decent though, but the sauce was a bit too mayo-tasting without any smokiness or char. As you can see, the food at Tentatsu was average with some highlights. Not surprising given the pricing and value-aspect.